This is my favourite all round illuminating product, it can be applied as a primer to boost radiance as well as prolong foundation wear, mixed in with foundation or as a stand alone liquid highlighter. It has a beautiful, light, liquid texture that grips on to any product applied on top, gives the skin a healthy glow and doesn't settle into open pores or fine lines. As a liquid highlighter it gives a very similar effect to Benefit Highbeam only it costs far less and can be used in so many more ways that one. Out of my four choices this is the most intense in terms of finish, I personally like to use this for special occasions or evening wear but fear not it is not glitter or shimmer based just more obvious in terms of results than the others. Out of my choices this is the most primer like - it really does prolong the wear of foundation even on the oiliest of skins and brightens the complexion. As you may or may not know I am quite sallow skinned which can mean I appear grey/dull at times, when this happens this is what I reach for. The pinky tone of this primer acts as a colour corrector while adding a beautiful, healthy glow to my skin. I find this works really well with Bourjois Healthy Mix Foundation and NARS Sheer Glow Foundation or any face product that already has a certain radiance quality. Unlike L'Oreal Lumi Magique Primer above this is really subtle and doesn't really highlight the skin rather it plumps and gives the impression of fresh, youthful skin. It is one of those products you really need to try out to understand. I should mention that it is fairly hydrating too making it great for drier skin types and the colder months. As many will know I am a huge fan of Lush Feeling Younger Skin Tint but must warn that is super reflective, almost metallic in finish. As a cream, targeted area highlighter I swear by it but wouldn't dream of applying it all over my face. Yet my friend does just that, one small blob mixed in with her tinted moisturiser (NARS if you are curious) and the end result is nothing short of beautiful. I should mention she is one of those annoying, almost poreless creatures but I felt it was worth mentioning should you have both products to hand or within your stash. The two cream consistencies seem to blend beautifully together. As a word of warning when using the Lush Feeling Younger Tint less is always more. My oh my does a little go a long way. I own a few shades of the Clarins Instant Light Radiance Boost Complexion Bases but I do tend to favour the shade rose, to an extent it is somewhat similar to L'Oreal Lumi Magique Base Pure Light Primer as it is a do it all product. It primes, it adds radiance and it can be used as a stand alone primer and again my shade choice Rose is an oyster shell pink hue which will remind most of Benefit Highbeam once again. What sets this aside from the other primer is that the Clarins version really holds make-up in place and has a far more flattering finish. As a liquid highlighting lotion it gives a soft focus finish a lot like the now iconic Hourglass Ambient Light Powders. The Clarins Instant Light Radiance Boost Complexion Base line up also feel more like skincare on the skin rather than a primer, it soothes and softens the skin as well as adding a radiant finish. Yes it is on the pricier side but you can't beat a good multi-purpose product and a little goes a long, long way. Annoyingly I can not find this in stock within the UK anywhere at the moment but in fairness that is very typical of Chanel. Oddly it works out cheaper purchasing from Nordstorm in the US even after taxes and p&p. Odd. Anyway...so you have a foundation you love but find that at certain times it can be a little cakey and/or gives a really heavy finish? Enter Chanel Le Blanc de Chanel Sheer Illuminating Base. Mix a little in with your foundation and suddenly you have the same level of coverage, the same shade but an easier to apply and blend out foundation that has a certain glow factor. Being a Chanel product I am sure you can imagine said glow is very subtle and is not akin to the sheen you get from any highlighting product. This has not been intended to be used as a primer but rather as a product to give a healthy, plumped out finish to the skin but it does prolong make-up wear. It doesn't do well as a stand alone radiance boosting product in my opinion, the magic truly lies in combining it with a liquid foundation. Again you really need to try this to believe the hype. Yes I am slowly becoming a Chanel gal along the way but this is easily the one product that I would recommend to all, Chanel fan or not. 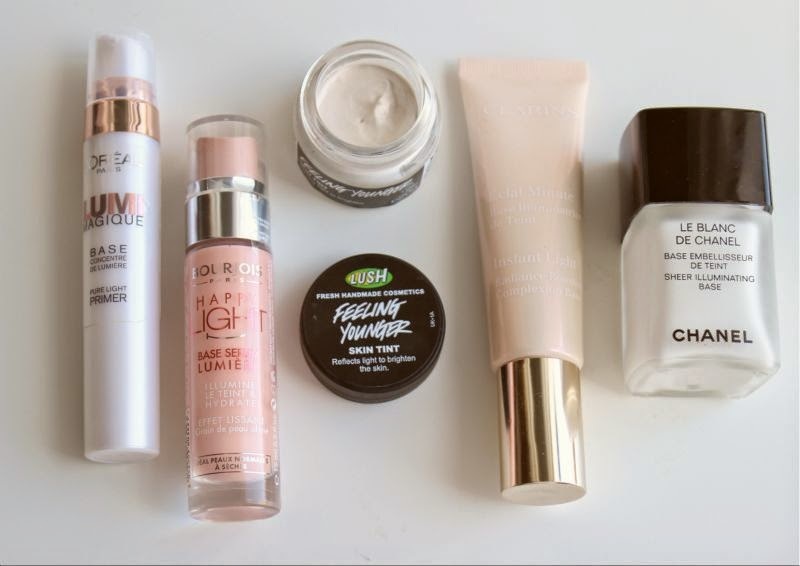 Do you have any radiance boosting primers you would add to this list? I personally look for mattifying primers with my oilu skin, but if you have dull skin and want to get a glow, these all seem like great picks! Really want to try Bourjois happy light heard so many great reviews about it ! I absolutely love that L'Oreal primer, it is so gorgeous underneath ANY foundation! Ive been considering getting the Loreal Lumi Magique for quite some time so i'm glad that you speak so highly of it! I love the Bourjois and the L'Oreal primers. I haven't ever tried any makeup from Lush and this skin tint sounds amazing. I'll have to check it out next time I am at Lush! I'm getting really into these illuminating bases at the minute so this post came at the right time! Loving the L'Oreal one. I am all about the glow! Everyone looks better with a bit of radiance and these reviews are super helpful in choosing just the right product for your skin type! I have oily skin so I never go for glowy highlights but I broke down and bought the L'Oreal one. I love it! I especially love that you could use it as a base all over or just as a liquid highlighter for the cheeks, etc.! I have the L'oreal primer and I love it. The only problem I have with it is that it separates. I really want to try Lumi Magique but I was always always worried about it being shimmery rather than a "glow from within" type product, I'm glad to hear it's not! Love the Lumi Magique! I am a massive fan of powder highlighters too. Love this, think I'll have to pick up the L'Oreal primer next time I'm in Boots or Superdrug! Lovely post, personally I have to stick to mattifying primers thanks to my horrible, oily skin!